The point of the Feature & Follow Hop is to gain blog followers for book bloggers. 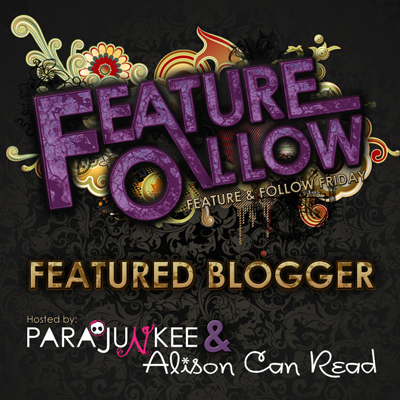 It's a great feature hosted by Parajunkee and Alison Can Read that showcases two bloggers each week and allows people to find new followers and new friends. And this week, I am the feature! Check out my little interview on Alison Can Read. I'm still giddy. Come follow, new friends! By whatever method is easiest for you. Check out the Linky at the bottom and join in! Q: Spring is in the air! Show off your favorite outdoors reading spot. If you don’t go outside...well where else do you read that isn’t inside your house? We want pics! A: This is my favorite spot in all the world, though I only read there once. It happens to be on top of the Palatine hill in Rome, above the forum, surrounded by the ruins of Domitian's palace. At the end of our month-long journey, hot and tired, my best friend and I trekked up here one afternoon and spent almost five hours just reading. She was reading The Da Vinci Code. I can't actually remember what I was, oops. There's our little bench. And yes, we did get lots of strange looks from other tourists. If you're wondering what the view from the top looked like . . . I look forward to stopping by your blog! That's so cool! What an amazing place to have read a book. I bet your answer will be the most unique this week! :D Now following you via Bloglovin' as well. Happy Friday! Wow! That has to be my dream spot to read. That's breathtaking. So glad you got to experience that. Congrats on the feature, too! New follower via BlogLovin'. My FF! That's such an amazing view! I envy all the local residents who can read there every day. Congrats on being feature by the way! That is such an amazing view! And such a great place to read - I hope I'll be able to experience that someday! That's truly a breathtaking view! I hope I'll be able to go there someday. :) Happy Friday! Congrats on being the feature. Wow I would love to go there... and read. Beautiful!! I am terribly jealous that you were able to read in such an amazing place. And grats on the feature! Hopping through. I wonder if I've been there. I was in Rome last year but I'm not sure if I went to that spot. Hi!! Super jealous as well!!! I love lemons and sarcasm so Im sure we'll get on fine. I went to Rome last October and I loves spending time sitting in beautiful places and reading! Congrats on being a feature, I'm following on Twitter! Thanks for sharing :) Hope you have a great weekend! Oooh that is such a cool place to read. Really beautiful. O.M.G.! Now that's one freaking awesome reading spot!! Awesomesauce! New GFC & BlogLovin follower wishing you a great weekend! That is such a fantastic spot! I am oozing with jealously to see something so beautiful. Going to Italy has always been a dream of mine. Great photos and congrats on being featured! Oh, how lovely! I've been to Rome once, but never to this spot. I'm a new follower via Feedly. Here’s my FF . Wow that looks amazing. Congrats on making Feature. That looks beautiful! I did something very similar when I was in Italy. I studied abroad in Florence and used to go on weekends to read and do my school work at the Boboli Gardens. It was such a beautiful and quiet place, you almost forgot you were in a big city. Congrats on your feature. New Bloglovin Follower. Happy FF! Congrats on being one of the featured bloggers! I would love to get lost in a book in Rome. Congrats on being the Feature this week! Wonderful pics! I love your blog name it goes so well with mine! :) I am a new follower with Bloglovin'! So beautiful! I think I'd probably be distracted by the amazing view! Wow, that certainly beats my back yard! GFC doesn't seem to work today…. will try again later. Wow, that is one lovely place. Guess you'll need to visit it again, huh? Congrats on being featured. What a beautiful place to read! Wow! What a spot! I think I'd spend five hours there too. I LOVE that you stopped there to read. What an amazing spot! I'm an old follower. I just wanted to say that I'm SO grateful and I will get to every individual comment and page, just might take me a little while. Awesome! New bloglovin follower. Hope you're having a great week!